Honouring an Expired Gift Card – How can we help? In Vend you can choose to give your gift cards an expiry date or not, and sometimes you may have a customer who has an expired gift card that they wish to use and that you wish to honour. Since the gift card is expired, Vend will not be able to process the sale through the normal gift card payment. Changing the expiry date of gift cards in your store will not retroactively change the expiry date for gift cards that have already been issued, it will only apply to those sold from that point onwards. For more information on how to set an expiry date for your gift cards, check out this article. Creating a new payment type will allow you to put the sale through with an Expired Gift Card payment type as opposed to putting the sale through as ‘cash’ or an existing payment type. This is because your day’s totals will not be aligned at the end of the day. You will also be able to track the times you have honoured expired gift cards in your payments report. 1. Create a new Credit Card payment type by going to Setup → Payment Types → Add Payment Type. 2. Select Credit Card under Payment type and call this new payment type ‘Expired Gift Card' or 'Honoured Gift Card' or just something that is easily identifiable as being for this purpose (and also won't be confused with the genuine gift card payment button!). Click Save Payment Type. 3. 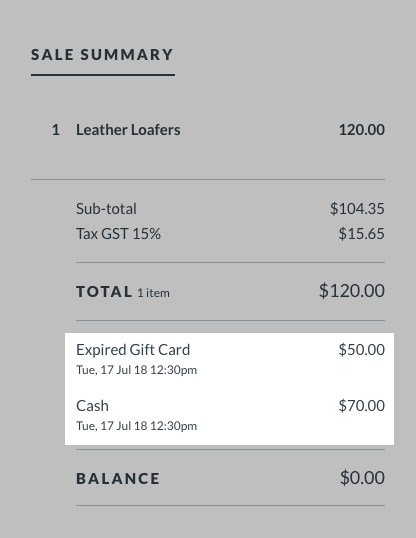 On the Sell Screen when ready to process the payment make sure the amount entered into the box at the top right is the exact amount of the gift card, or less, and choose this new gift card payment type. 4. If the sale is more than the amount of the gift card the customer will be able to split the payment and pay for the outstanding balance of the sale using another payment type. 5. The actual gift card will remain as expired in your store records, so make sure to take the gift card from the customer after the sale and throw it away so that it cannot be reused.